I’m the reason the newsletter is late this week. I’m writing from a hotel room in Canberra. We’ve arrived safely with our Year 6 students and tomorrow will embark on a great adventure with them. 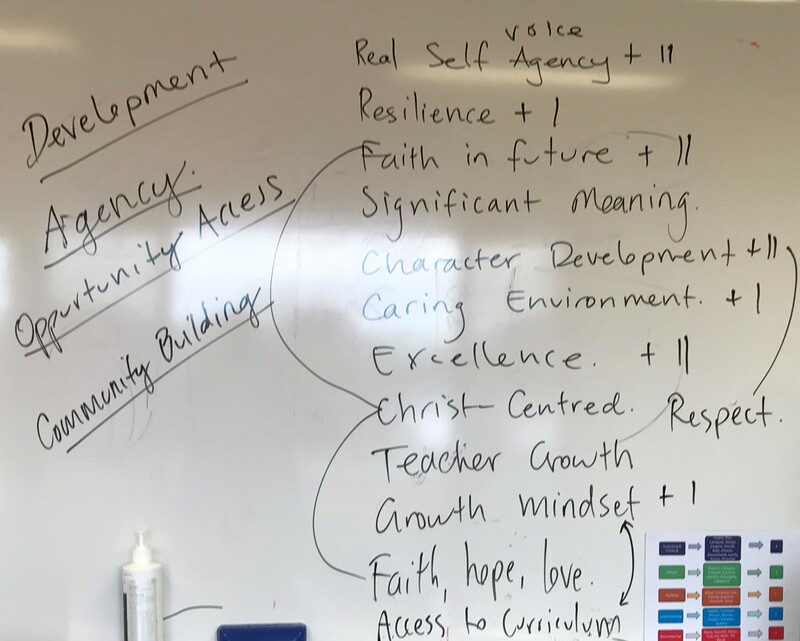 Recently, I’ve had a lot of opportunities to hear some very good seminars on leadership: At our annual Principal’s retreat for SCEA, the SCEA conference (while you had a midterm break with your kids), and two days of seminars for our association around the subject of community building. At one point, the idea of having a clear sense of speaking the same language regarding the College’s direction was raised. I want to be very intentional about this, so at our College weekly leadership team meeting (involving David Elsing, Antoinette Wilson, Will Meyer, Anna Guy, Craig Choveaux) I asked this question: "Please write down the four major areas that you think are most important to me in setting the unique direction of our college". We wrote down and connected the ideas on the whiteboard in my office which is pictured below. Fortunately, there was a high degree of convergence, although some used different words to express the same idea. On the left of the picture are the four I wrote down. I thought it a good idea to raise them with you. Hopefully, you will hear and see these become a reality in our College. Let me give you a brief explanation. 1) Development: I want the language and intent of our college in dealing with our students to move from the commonly used term of student behaviour management to student personal development. “Behaviour Management” implies a set of skills that a teacher uses to manipulate fundamentally unruly students into doing what those managers want. Students are seen as deficient, power resides outside them. I want the core of our process to centre on students themselves developing personally the character and internal drives as they mature to be the decider of their actions. That as learners, from the very beginning of their development to the verge of adulthood, our focus is what they are becoming: making choices, growing in resilience, self-determination, grit and care. 2) Agency: this is like the first point. It speaks about student agency or “voice”. Our students are regarded as valuable contributors to our community. The choices they make matter, they are included in the discussions and decisions we make. Our College is not to be a place where adults make all the decisions regarding disenfranchised children. Inherent in their creation is their value and a purposefulness in living. They matter at every level of their growth and deserve our fundamental respect and consideration. 3) Opportunity/Access: we are not modelled as most schools are, especially at the Secondary Campus. Most schools assess students at Year 7 and onwards and place them in streams: advanced, standard, general. I’ve spoken about this regularly, but both research and I personally, think this is appalling. Imagine what it means to say to a 12-year-old: We’ve assessed you and we think this is all you are capable of… once streamed, so many assumptions are set in gear, teachers teach to that level, students rarely get out of those classes, “advanced” students don’t get to help others, “standard” or ”general” students don’t get to see advanced work. By Year 11, they are then often restricted in the courses they are allowed to choose. I want every student in our college to have access to the same curriculum. I want our assessment process to say: Now we know where you stand, let's have hope and work together to get you to the next level. We’ve seen what some people may view as pretty“ordinary” students become extraordinary in their accomplishments when given this opportunity and hope. 4) Community: We are partners together with parents for the best for our students. This is a complex community: students, staff, parents, broader family and friends, local and broader communities, our world. I want us to continue to work on better relationships, more diverse and clear communication, understanding where we are coming from, how we contribute together, being inclusive and providing opportunities for all of us to contribute together to build better than we could separately. So that’s what we're on about, this will be our focus and uniqueness…and there’s more.